Privacy is more and more important to visitors and especially in Europe, privacy laws are very strict. Did you know that you even have to offer a link to allow your visitors to opt out from Google Analytics tracking directly on your site? So, in this post I am going to show you how to implement and use such a link. The easiest solution to not send your visitors data to Analytics is simply by not using it on your site. But, of course, that is not the solution I am going to discuss here. This leaves solutions either on the visitors or the webmasters end. The solution to opt-out from Analytics as a visitor is offered by Google itself in form of a browser plugin. You only have to activate it in order to not get tracked on any site using Google Analytics. You find it here. Also a lot of AdBlockers or other browser plugins might have this feature included. However, this can not serve as a general solution, because some browsers are not compatible with such a plugin, especially those on mobile devices. For now, I will concentrate on the solution on how to offer this opt out link and how to implement it on your site. My tutorial is written for WordPress, but you can probably use a lot from it for other cms as well. You can opt-out from Analytics tracking by clicking on this link: (Link). I am open for a better wording, so please feel free to suggest something in the comments below. You can take the script for the opt-out link directly from the example on the Analytics developer forum. Make sure to edit your page in the text editor and not the visual editor so the html code is working. The function that is called with the Analytics opt-out link does currently not exist. You need to insert it into your website’s code before the actual Analytics code. This is very often the header, but can also be in the footer. To make it work you need to change the ua code in the third line into the one from your Google Analytics account. The code will simply create a cookie that expires in 2100, so it practically works forever or until the visitor cleans the cookies in his browser. If you implemented the Analytics code into your WordPress theme, you need to find the file where you put it first. Then simply copy the code from above and put it above the Analytics code. Don’t forget to change the UA code to the one from your Analytics account. If you inserted the Analytics code in WordPress with the help of a plugin you can put the following code into the functions.php file of your theme (if you use Google Analytics by Yoast see the following section). This code will put the code into your header. Don’t forget to insert the correct UA code. 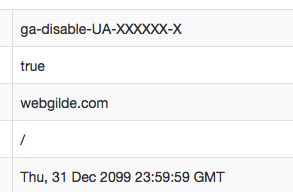 If you are using the Google Analytics for WordPress plugin by Yoast, you can even get the UA code from it. This is especially helpful when you run a multisite and every single site has its own tracking code. Simply include the following code into the functions.php file of your theme. Just a word of caution: after I wrote the first version of this code the Analytics plugin was updated, a global variable I used was gone and my site crashed. This code works, but of course I can’t guarantee for how long. If you use another Analytics plugin and know how it stores the UA code, you can manipulate the first lines accordingly. Use the third variable in the first line (“5” in my example) to play with the position of the code in case it is inserted below the Analytics code and therefore doesn’t work. For those of you who are not comfortable with hacking their theme files or who don’t have access to them, there is also a very powerful plugin that can help. It is simply called the Google Analytics Opt-Out WordPress Plugin. The plugin also works with Yoast’s Analytics plugin and – what I like – doesn’t bother users who already clicked on the link. Testing the Analytics opt-out is rather simple if you know how to check the cookies set in your browser. I am using the web developer toolbar for Firefox, but there are plenty of other ways to check. You can simply delete it if you want to enable tracking for yourself again. This example code assumes that you are using a single web property on your site and are only using a single domain. It only provides an opt-out function which is based on a long-term cookie. If you require opt-in functionality or if your site uses multiple web properties or domains, you will need to modify this example code, write your own opt-out code, or use other opt-out tools. The whole topic of data usage and privacy is very complex. However, I hope I was able to help you make your site more complient with local laws. If you feel like I forgot something or you want to add an important note, don’t hesitate leaving a comment below. Thank you for the great article Thomas! It is a very helpful summary of the whole GA implementation process. is it possible to put more than one GA property in the opt-out script? Sorry, but I have no idea if that is possible. I just wondered, since Google recommends using a 2nd property to track AMP versions. To provide an opt-out from that you would have to put that property into the code, too. That would be my preferred solution. Period. Why are so many website owners using this Analytics crap anyway? Because it makes things so much easier? Have the 2013 Snowden revelations really diminished that much in everyone’s minds? Forgot that Google is one of the major providers for Prism? I’ve followed your instructions above , but am curious what should actually happen from a user perspective when they click the opt out link? Hi Patrik, I am not completely sure, but I think you can only opt out of Analytics completely with one solution. I think there was a browser extension for this as well. Hi Jason, it should be possible to load another page. You’d just need to change the code accordingly. Unfortunately, I have other priorities to work on and can’t provide that change.